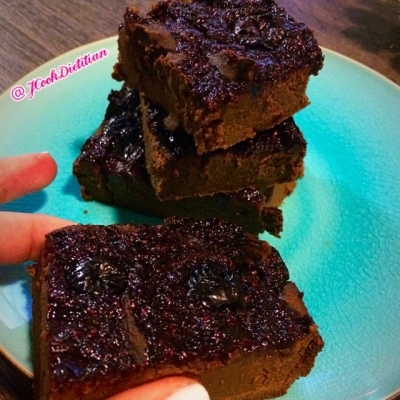 Rich, fudgy dark chocolate protein brownies with a sugar free chia cherry jam swirl! Low carb, gluten free and high protein! Chia chocolate jam: 1 cup frozen dark sweet cherries, 1 tbsp chia seeds, 2 tbsp lemon juice, 2 packets stevia. Blend all ingredients in a food processor and cook on medium low heat until thickened about 10 min. Brownies: 1 cup butternut squash, 1 Mashed banana, 2 eggs, 2 tbsp almond butter, 1 scoop chocolate whey protein, 1/4 cup unsweetened cocoa powder, 1/4 cup coconut flour, 1/4 cup agave nectar, 1/2 tsp baking powder, 1/4 cup melted dark chocolate (I used Lilly's dark chocolate stevia sweetened chips) Blend all ingredients in a food processor and pour into greased 8 x 8 pan and bake at 350 degrees for 25-30 minutes until brownies are cooked through. Enjoy! !